# 2 internal SATA II port & 1 internal IDE 40P port allow to connect more devices to your computer. # Stable and reliable chip JMB363. # Compliant with Single-Lane (x1) PCI-Express specification revision 1.0a. # Compliant with Serial ATA specification revision 2.0 & 1.0. # Compliant with UDMA6 ATA/133 specification. # Supports 2.5Gbps throughput PCI-E with full duplex channel. # Data transfer rate up to 300MB/s (3.0Gbps) per SATA port. # Data transfer rate up to 133MB/s (1.3Gbps) per IDE 40P port. # Supports 2 independent Serial ATA channels. # Supports 2 IDE channels and connects up to 2 IDE devices. # Support ATAPI devices: CD-ROM, DVD-ROM, etc. # Supports Native Command Queue (NCQ) on SATA II port. # Integrated Serial ATA Link and PHY logic. # Support RAID 0, 1, 0+1 & JBOD. 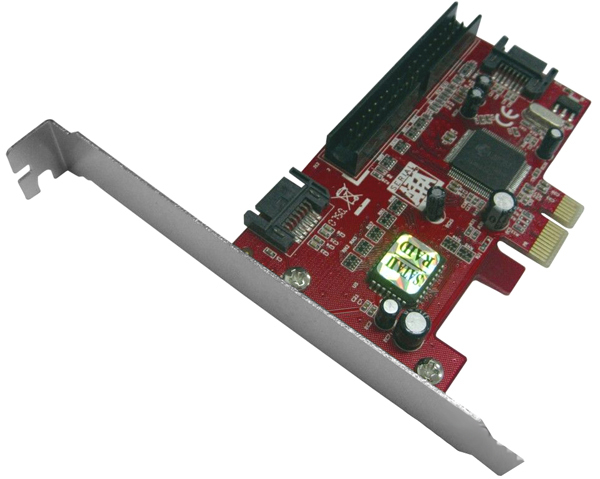 # Supports PCI-E & SATA plug and play. # Operating System: Windows 2000, XP, 2003, Vista & Windows 7.